Now everyone knows I'm not a fan of most artists, especially a lot of newer artists, but there are several who I am following closely, waiting for an official release to drop. As each day goes by however, I notice that many of them are taking part in what has to be "the new industry". These guys aren't really laying the groundwork for albums with some features and what i would consider a 'true' mixtape. What I am seeing is that people are just recording and putting out music, maybe getting a few hits on itunes and Myspace, but their goal is to get it out into the blogosphere and let it bubble from the bottom up. 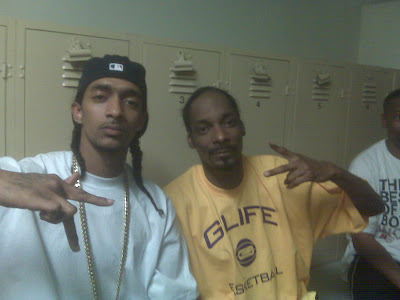 A recent example is a new song from Snoop and Nipsey Hussle, well that's backwards because it is Nipsey's song. The point is that radio is no longer necessary for guys like him to make music into a career. Getting a solid fan base that may be smaller is a benefit to this guy because thye know his music regardless of what medium it shows up in and are wiling to pay and see him perform. While he may not have the amount of "fans" as a Lil Wayne or Snoop, he manages to have people who are dare I say, Die-hard so he has a bse to make sales when he does eventually release an album. A good example of harvesting this power is Slaughterhouse. While they aren't going to break the ringtone sales records, they managed to pull off decent sales with no promotion other than themselves on the likes of Twitter, Worldstarhiphop, Myspace, and their own websites, most notable JoeBuddentv.com . They also put together each of their own groups of fans and brought them all together to create support for the group and have been touring almost constantly since the group was announced and formed, all while flying under the radar of radio and the Viacom Conglomerate, though they do have a video in rotation on MTV Jams. Previously, on this blog, there was a discussion on whether or not the internet was helping or hindering hip-hop. At this point it is helping it, however the music is so fragmented right now that it is crazy. There was a time when you heard everything except music from the South (yeah that was wrong, there are Southern artists that should have gotten some shine) but now the media is dominated by music that all sounds alike. The net has allowed people like The Cool Kids to really get some sort of buzz. The one problem is with so may sites just promoting random songs there is no "trust" of who you should be listening to. The Source used to have the credibility to predict artists, but now they just try to jump on people after they get a single in heavy rotation. GS BoyZ where art thou now? songs on them but some actual content. List away.